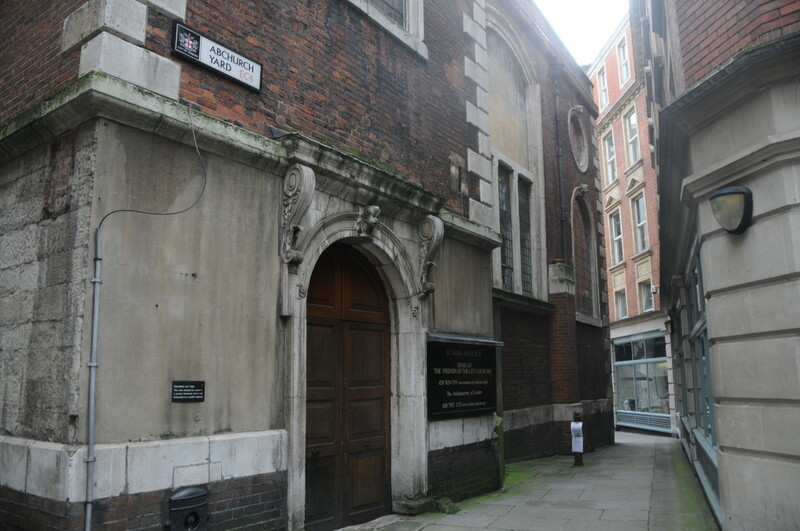 If you walk down Cannon Street towards Eastcheap, it is easy to miss Abchurch Lane, however it is well worth a quick detour as a short distance along Abchurch Lane is the church of St. Mary Abchurch, one of Wren’s churches rebuilt after the Great Fire of London and one that has altered least since it was built. St. Mary Abchurch is not one of the City’s most well know churches and it does not sit directly on one of the main thoroughfares through the City. From the outside, there is nothing to suggest what may be found within, but it is well worth a visit. In front of the church is a small paved churchyard, now mainly used for City lunch breaks, whilst the church with its relatively short tower and steeple just manage to hold off the surrounding offices. I am sure that many of the City workers entering and leaving the restaurants here today would equally enjoy the “wines and good dinners” of the 17th Century. A church has stood on the site since the 12th century. 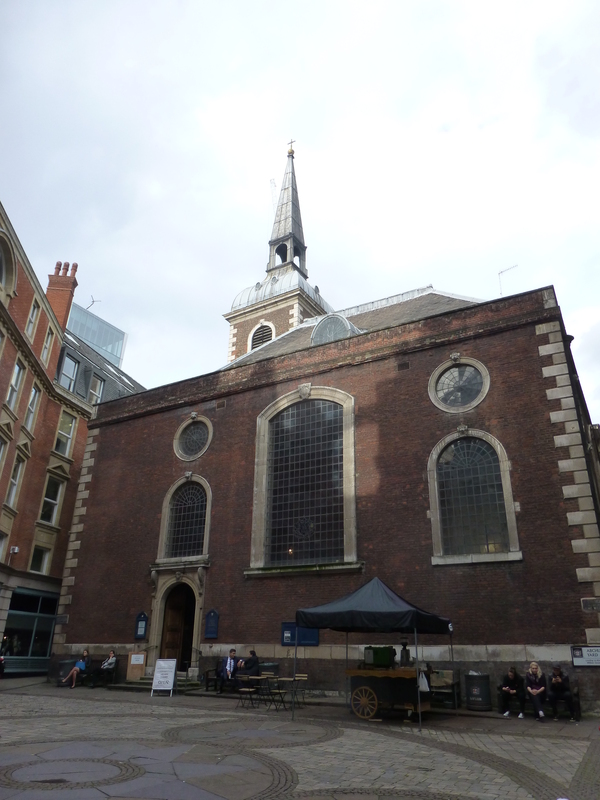 As with the majority of other City churches, the Great Fire destroyed the church that stood on the site in 1666. Work on the new church commenced in 1681 with completion in 1686. According to Stow, the parish church is named after “Saint Marie Abchurch, Apechurch or Upchurch” and in medieval documents the church is referred to as St. Mary Upchurch. Once inside the church we can see one of the unique features of St. Mary Abchurch, the superb carved reredos (the large wooden screen covering the wall at the back of the altar). 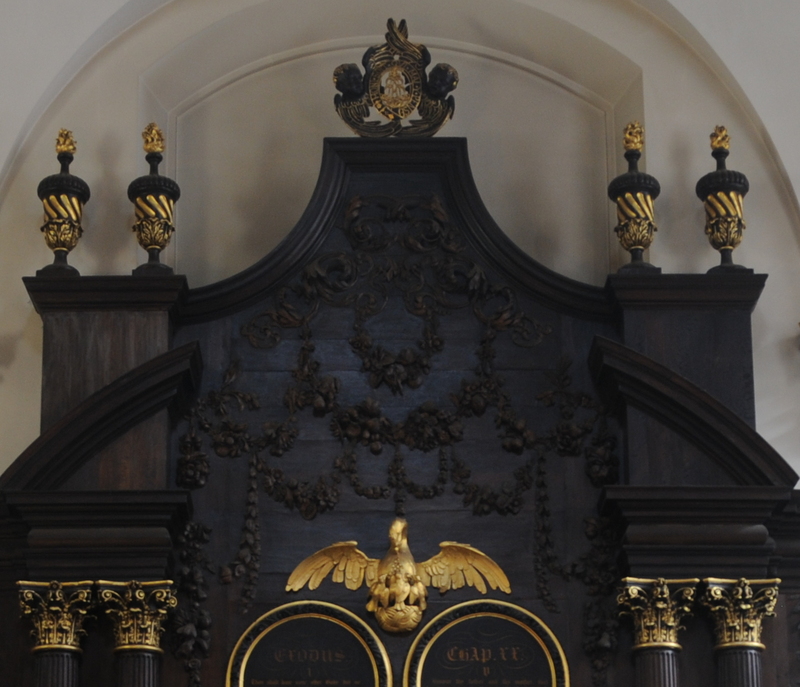 The carving on the reredos is the work of Grinling Gibbons, the greatest of decorative wood-carvers and the only known work of his in any London City church apart from St. Paul’s Cathedral. Grinling Gibbons was born in Rotterdam on the 4th April 1648 to English parents. Gibbons moved to England in 1667 firstly to York, then to London. John Evelyn was instrumental in introducing Gibbons to Christopher Wren and Samuel Pepys. His work was extensive, the King’s Chapel in Windsor Castle, Badminton House, Burghley House, Trinity College Library, Cambridge, Blenheim Palace and St. Paul’s Cathedral to name a few, however St. Mary Abchurch was the only City church to include his work during the rebuilding after the Great Fire. The dark varnishing of the wood is from the Victorian era. Gibbons carvings were originally in their natural Limewood finish and must have looked fantastic. The close-up photo to the left shows the carving (although the same dark varnishing as the backing does not make this easy to see) but the gilded Pelican stands out well. Gibbons original 1686 receipt for this work is held in the Guildhall Library. St. Mary Abchurch as it was pre-war is shown in the following photo. Look up, and you will see the superb painted dome of the church. It is the dome that gives the large open area of the church, uncluttered by pillars. The dome, which is over 40 feet across rests on the four brick walls which is an architectural achievement as there are no buttresses to support the walls. The whole weight of the dome is supported by and distributed down through the walls. 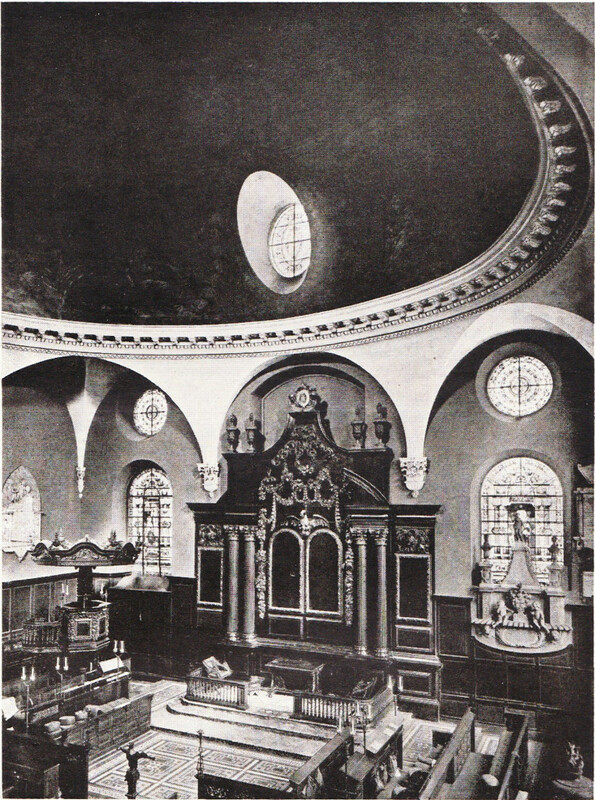 Wren’s use of the dome enabled what is a relatively small space to appear very spacious. 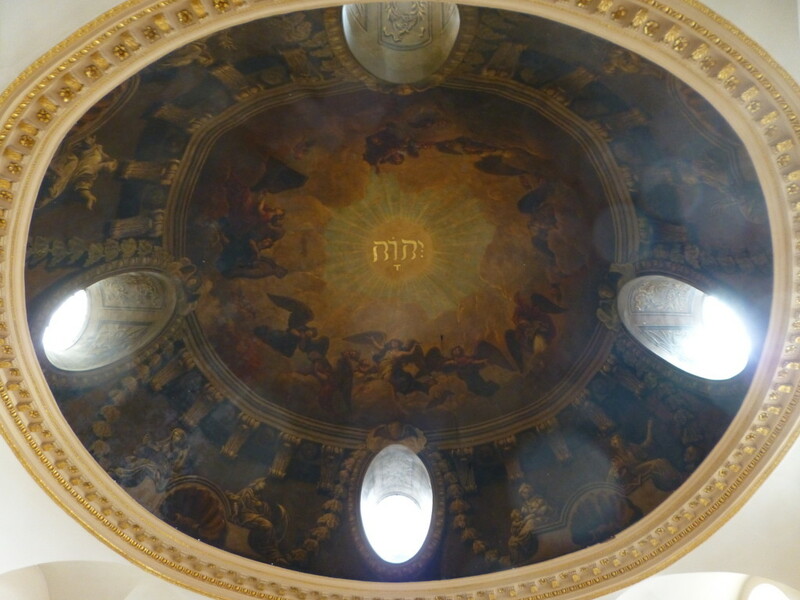 The original painting of the dome was by a parishioner of St. Mary’s, William Snow. The dome was badly damaged by bombing during 1940, but has been very skilfully repaired. Sometimes looking at City churches, particularly those rebuilt after the Great Fire, it is difficult to fully appreciate the age and continuity of use of these building. St. Mary’s has a very clear demonstration of both age and continuity. 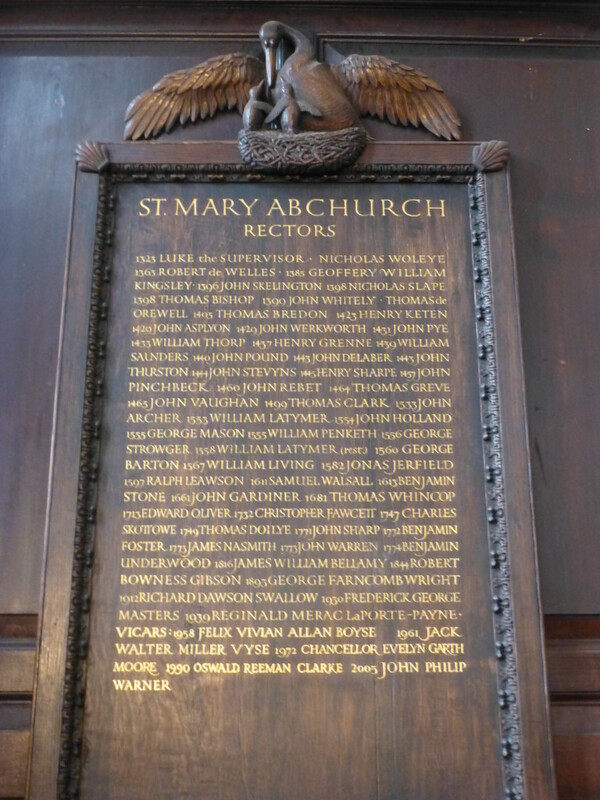 Look at the carved board listing the names of rectors of St. Mary Abchurch. This details the names of rectors from 1323 through to the present day. Fascinating to stand and look at these names and pick out events that must have been such key events in the rector and parishioners. 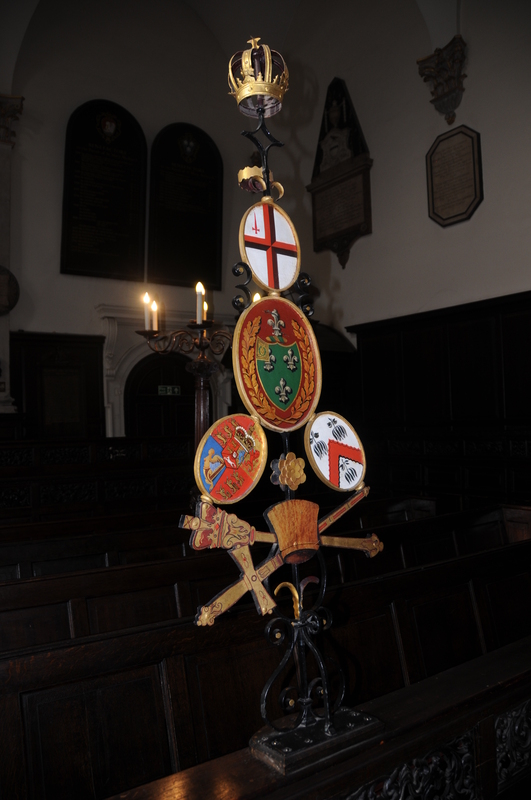 John Vaughan was rector when Richard III was killed on Bosworth Field in 1485 which resulted in Henry Tudor taking the throne as Henry VII and which ushered in the Tudor dynasty. 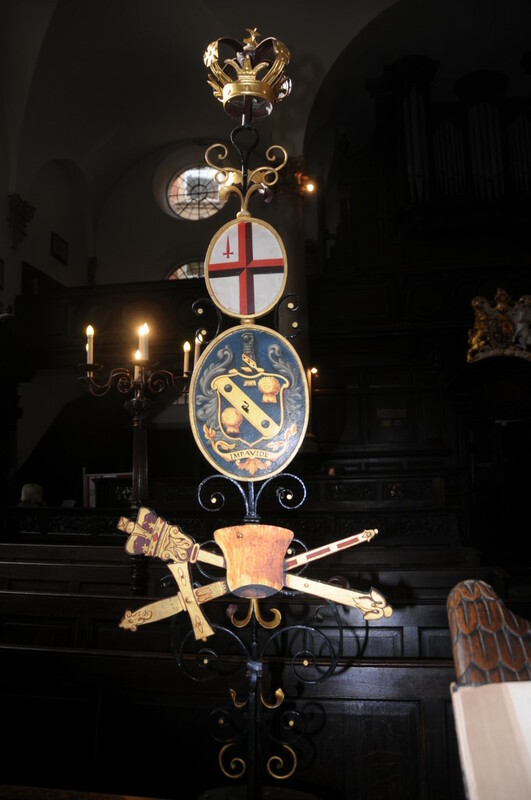 Benjamin Stone was rector in 1649 when Charles I was beheaded after the English Civil War, and John Gardiner was rector in 1666 when the Great Fire destroyed the predecessor of the current St. Mary’s. 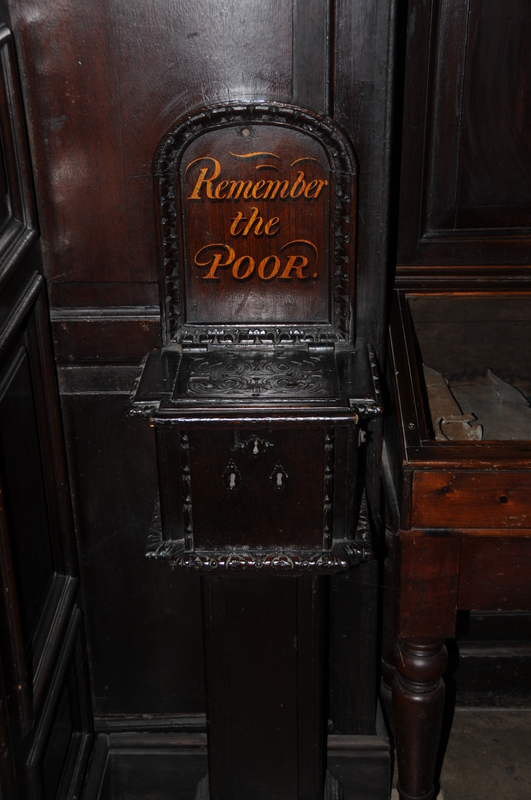 Just inside the church, by the entrance is an original Alms Box dating from 1694. Come back outside the church, turn right and up through Abchurch Yard. This small alley was quiet even during a weekday lunchtime and gives a feel of what much of the City was like when buildings pressed closely together and small lanes ran between the major streets. 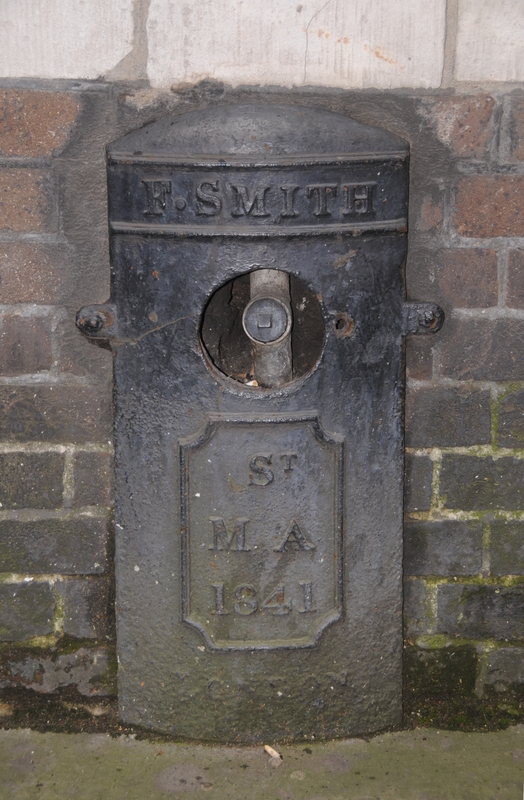 Just to the bottom left of the above photo is an old hydrant cover from 1841. This is one of the best preserved I have found so far of these. The pipe and outlet are clearly seen in the hole in the centre. Only the cover that was originally across this hole is missing. 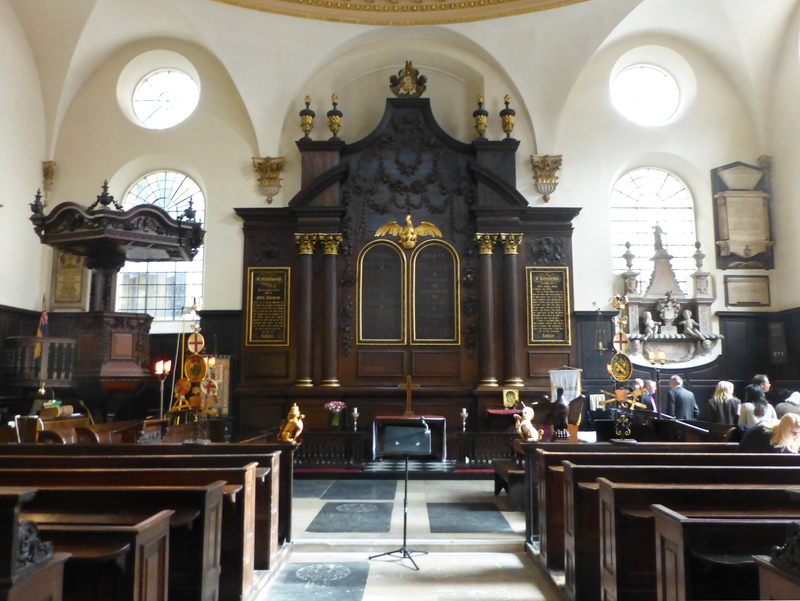 I recommend a visit to St. Mary Abchurch, a beautiful Wren church much unchanged since completion. This entry was posted in London Churches on November 2, 2014 by admin.